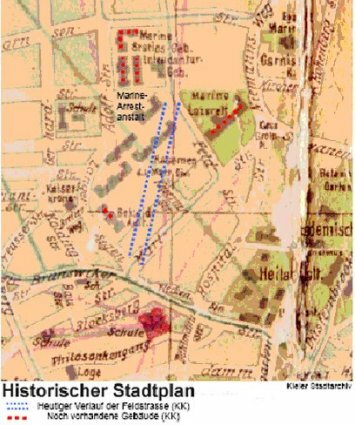 At the raod junction Karlstraße (no more visinble in todays Kiel because of a street redesign after WW II), Langer Segen and Brunswiker Straße Sub-lieutenant Steinhäuser ordered his troup to shoot at the demonstrators, who wanted to advance to the military prison (Arrestanstalt). Also some demaonstrators shot back. Seven were left dead and 29 injured, out of these two died later on. 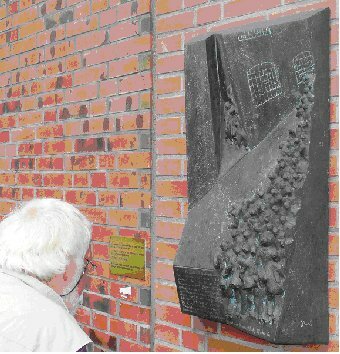 A plaque sponsored by the Arbeiterwohlfahrt and created by Hilger Schmitz in 1994 at the road junction Feldstraße - Langer Segen commemorates the event. 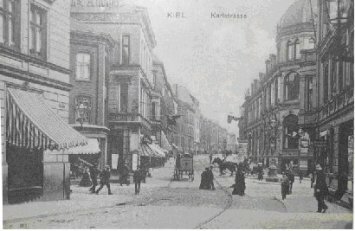 (Photo K. Kuhl, 2007) Photo from an exhibition at the Warleberger Hof, Kiel, Oktober 2007: „Die Hoffnung“ at the corner Karlstraße around 1905. The view is from the Muhliusstraße crossing the Brunswiker Straße into the Karlstraße. Not far away, in the Ratsdienergarten (Jensendamm corner Dänische Straße) 1978-1982 the monument 'Wik' was errected by Hans-Jürgen Breuste, commisioned by the City of Kiel. 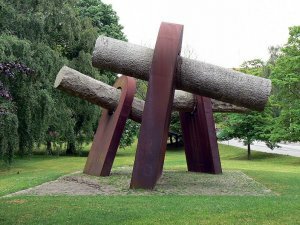 The sculpture made of weathering steel reminds passers-by of the Kiel mutiny (sailors rebellion) in 1918.